It’s that time of the year again, for Winter foods that comfort the soul: hot chocolate, apple cider and soups… All of this yumminess that takes the chill out of your bones, on a cold evening. I lived in Iowa where it snowed 7 months out of the year and I know all about that chill that goes through your bones that makes you want to stay in your house cuddled up under a blanket and a crackling fire. We no longer live in snowy weather but it still gets pretty chilly here come Winter season and soups is my favorite way to make the best of it. And this soup is not just comforting but it’s hearty. It’s packed with all sorts of good for ya nutrients that come from the sweet potatoes and quinoa. Our boys loved this soup. My 2 year old who is very expressive about his love of food kept saying after each spoonful “yummmm, yummmmm” that’s what I kept hearing from that end of the table. I must say thought that one of my little guys who is not into food with lots of texture didn’t care for the Quinoa in his soup but my husband is the same way but he had seconds. Next time, I will add the quinoa to each bowl instead of the whole pot. I also served our boys first and then added the chipotle to the pot for us adults to enjoy. 1. Peel and dice sweet potato. Place sweet potato on a rimmed baking sheet and drizzle with 2 Tbsp. olive oil and salt. Roast in the oven for 20 min. at 400. 2. 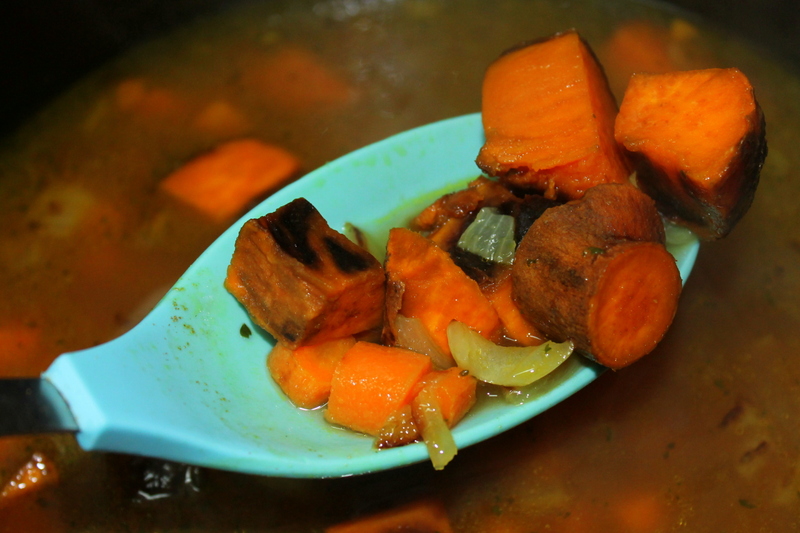 In a large pot saute onion, garlic, cumin and carrot in 1 Tbsp. butter until tender. 3. Add potato to the onion mixture and add the chicken stock. Simmer for 20-30 min. until all vegetables are completely tender. 4. Blend mix until pureed. 5. Place quinoa and puree mix in pot and reheat. Add chipotle now if your kids don’t mind spicy if they do then add it to the pot after you have served them. 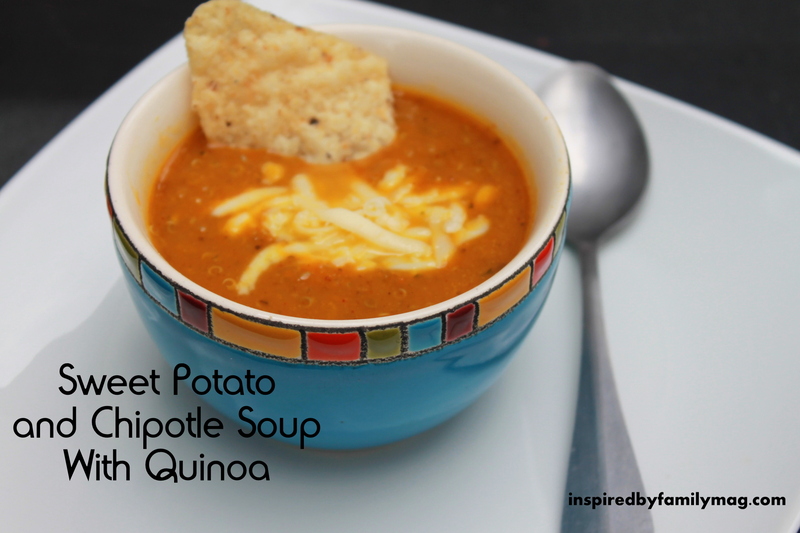 I loved that this soup is hearty but light. Enjoy! Note when cooking quinoa I have found that the best results is to rinse quinoa in a mesh strainer under running water rubbing it to remove the bitter taste. 2 cups of water for every 1 cup of quinoa. I share here the full recipe and tips. Debbie, it is! enjoy! I love that you comment on our ezine.